July 2, 2012 – BMW announced this morning the new F 700 GS and revised F 800 GS motorcycles. 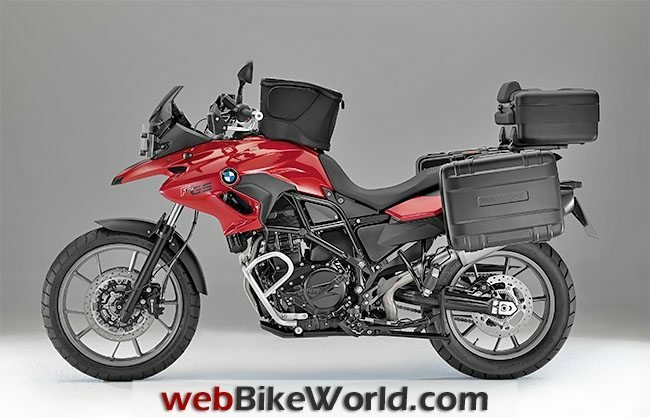 Although BMW doesn’t specifically say it, the F 700 GS will apparently replace the F 650 GS (report). There is also no indication whether the F 650 GS Sertão (report) will be updated as an F 700 GS with better off-road capabilities. 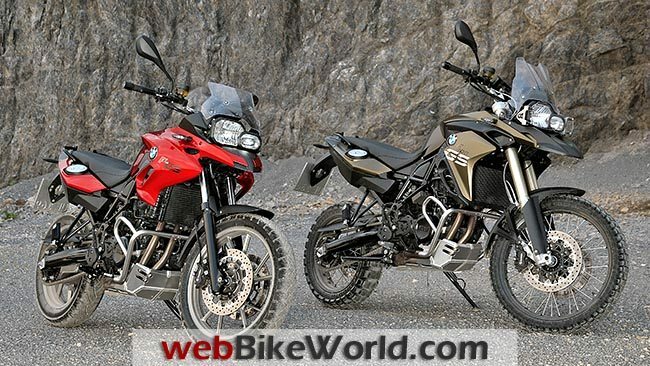 The two bikes seem to have overlapping specifications, closing the gap between the old F 650 GS and F 800 GS. 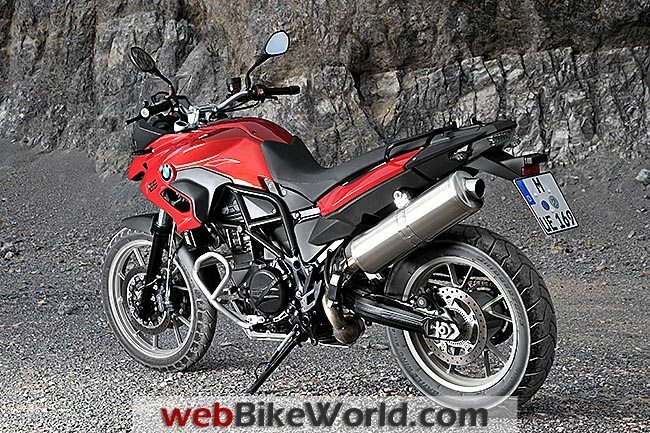 For example, the F 800 GS has a claimed 85 HP engine, while the new F 700 GS engine is rated at 75 HP. Torque is even closer at 83 Nm for the 800 and 77 Nm for the 700. 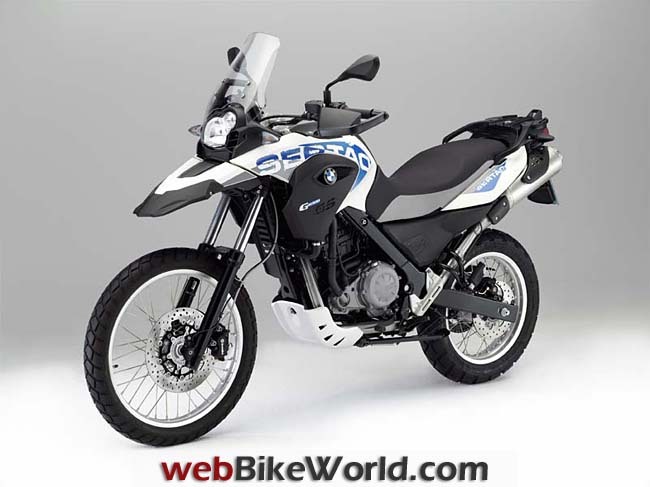 BMW extended the GS family with an entry-level and medium category in 2007 in the form of the F 650 GS and the F 800 GS. The goal was to have fun-to-ride bikes that were lighter than the big R 1200 GS while still providing off-road capabilities. BMW Motorrad now continues this chapter of the GS success story with the updated versions of these two successful enduro models: the F 700 GS and F 800 GS. BMW said that they faced the challenge of taking something that is already good and making it even better, consistently focusing on building on the characteristic strengths of the GS in refining the concept. The new F 800 GS combines suitability for road use and touring with superior off-road qualities, bringing the two worlds together to an extent not previously seen in this class of motorcycle. By contrast, the new F 700 GS is geared more towards motorcyclists who do not yet need quite the same level of off-road expertise. Its strengths are a lower seating height, all-round capabilities for everyday use and more than sufficient power while also offering outstanding economy. In accordance with their “Safety 360°” principle, BMW Motorrad provides BMW Motorrad ABS as standard in the new F 700 GS and F 800 GS. The new F 700 GS and F 800 GS also feature other safety-related innovations within their respective classes such as the optional ASC (Automatic Stability Control) and the likewise optional ESA (Electronic Suspension Adjustment). The well-proven parallel twin F 650 GS now with increased output and torque for the new F 700 GS. 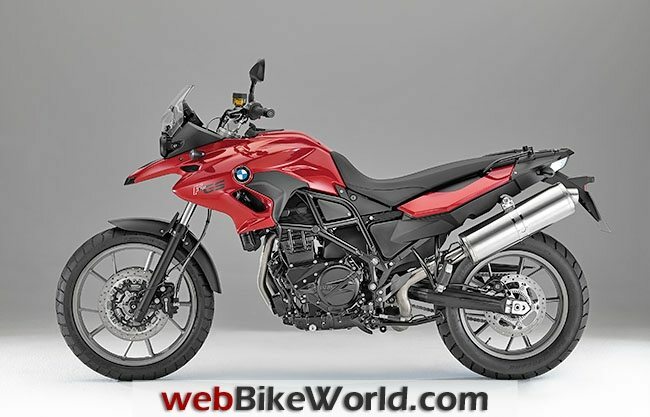 Both the F 700 GS and the F 800 GS continue to draw their power from the distinctive, liquid-cooled 4-valve 2-cylinder engine with 798 cc, electronic fuel injection, closed-loop catalytic converter and 6-speed gearbox. Its spontaneous response, impressive pulling power and low fuel consumption are what give it a particular fascination. Another unique feature in serial production motorcycle manufacture is the mass balance based on an additional connecting rod. This compensates for first- and second-order inertia forces, ensuring that the two-cylinder engine runs with a low level of vibration. 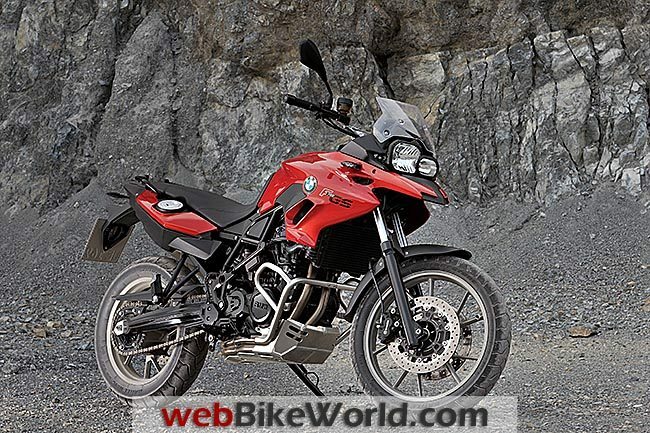 As compared to its predecessor, the BMW F 650 GS, the new F 700 GS benefits from a boost in terms of output and torque. With 55 kW (75 hp) at 7,300 rpm (F 650 GS: 52 kW [71 hp] at 7,000 rpm), its engine now delivers 4 hp more power and with 77 Nm at 5,500 pm (F 650 GS: 75 Nm at 4,500 rpm) it also sees an increase in maximum torque. In conjunction with a somewhat shorter overall gear ratio, the bike now offers even further enhanced engine performance and riding dynamics. F 700 GS now with dual disc brakes and standard ABS. The new F 700 GS and F 800 GS draw on established suspension technology. The steel frame in tubular construction integrates the engine as a load-bearing element. The rear frame in square steel tubing, the aluminum double-sided swing arm and the wheels and tires all remain unchanged. Like the F 800 GS, the new F 700 GS is now fitted with a dual disc brake on the front wheel. What is more, the two new GS models are fitted as standard with a new generation of the BMW Motorrad two-channel ABS for the first time. Optional Electronic Suspension Adjustment (ESA). The BMW Electronic Suspension Adjustment is a new feature available in this class of motorcycle. Available as a factory option, it allows the rider to conveniently set the rebound stage damping of the rear spring strut at the press of a button on the handlebars, with the settings “Comfort”, “Normal” or “Sport” available, thereby adapting the set-up to the needs of both route and riding style. The handwheel for setting the desired spring mount has been optimized for improved controllability. Optional Automatic Stability Control (ASC). 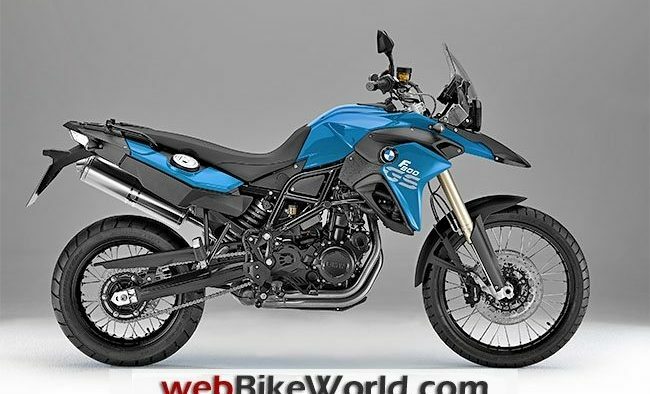 BMW Motorrad ASC (Automatic Stability Control) is likewise a newly available factory option which is also unique in the market segment of the new F 700 GS and F 800 GS. This BMW Motorrad traction control system prevents unwanted spinning of the rear wheel while accelerating, which would result in the loss of lateral grip and thus break-out of the rear wheel. 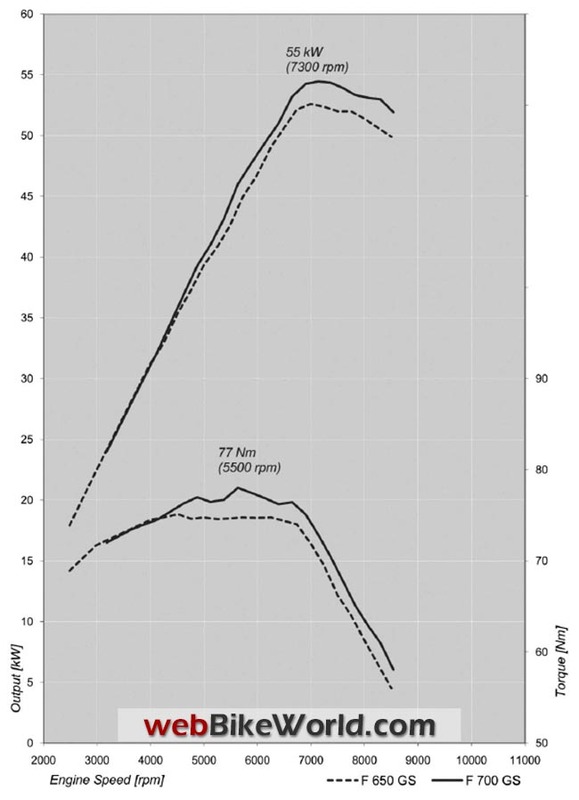 The welcome consequence — especially when the road surface offers reduced friction — is an increase in riding safety. The new F 700 GS and F 800 GS each feature the latest generation of BMW Motorrad switchgear units. These are more compact in design and offer improved ergonomics. The increased dynamic performance and even more harmonious appearance of the new F 700 GS and F 800 GS are reflected in the new smoke grey glasses for the turn indicators and a smoke grey glass covering on the LED rear light. In terms of shaping, too, the new BMW F 700 GS and F 800 GS have been upgraded to create a clearer design more in keeping with model character. The main revised areas are the new side trim sections, which are now more striking and dynamic in styling and reflect the differing characters of the F 700 GS and F 800 GS even more authentically. The package of visual measures is rounded off with new paint finish concepts and inscriptions. 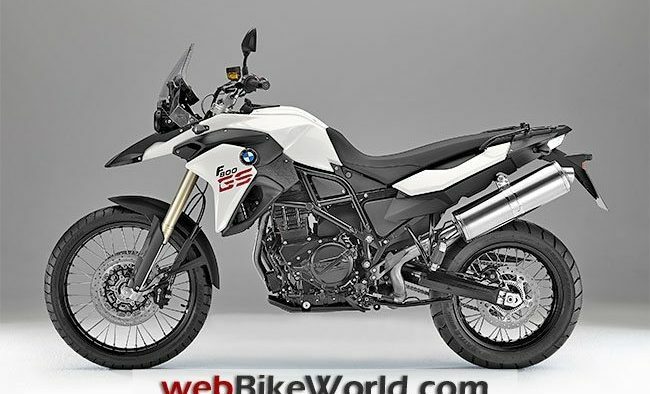 In response to popular demand among existing F 800 GS customers for a reduction in seating height, BMW Motorrad now offers a lowered suspension in conjunction with a lower seat as an ex works option and as a special accessory. Extensive expansion of the range of options and special accessories. Increased output and torque in the F 700 GS as compared to predecessor model: 55 kW (75 hp) at 7,300 rpm (F 650 GS: 52 kW [71 hp] at 7,000 rpm). Dual front disc brakes on the F 700 GS and F 800 GS. Rear spring mount can be adjusted via optimized hand wheel. New paint finishes for the F 700 GS: Red apple metallic, Ostra grey metallic matt and Glacier silver metallic. New paint finishes for the F 800 GS: Kalamata metallic matt, Cordoba blue and Alpine white 3. Automatic Stability Control ASC (optional). Electronic Suspension Adjustment ESA (optional). 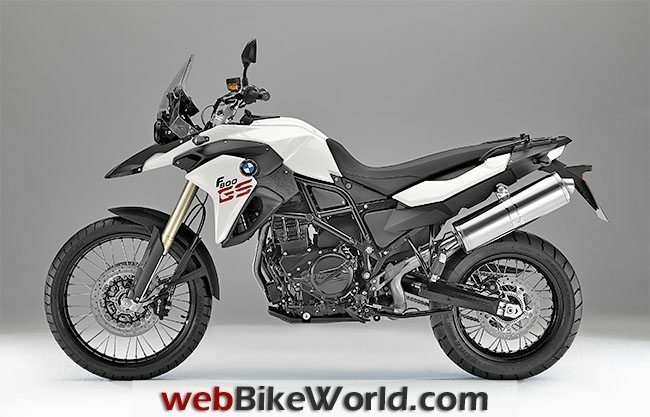 Lowered suspension for F 800 GS (option/special accessory). Power reduction to 35 kW (48 hp) (optional). Engine map adjustment for regular fuel (RON 91) (optional). Comfort seat now available as an option also. Case carrier for Vario case now also available as an option. Comfort package: on-board computer, heated grips, case holder, center stand (optional). Safety package for F 800 GS: ASC and ESA (optional). Safety package for F 700 GS: ASC, ESA, RDC (optional). Wide enduro footrests (special accessory). 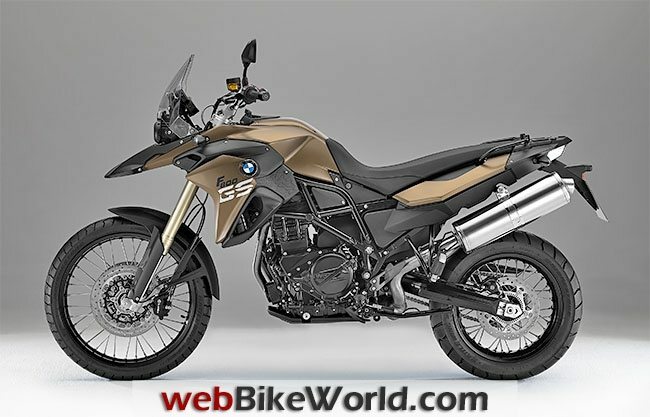 The main differentiating technical features at a glance:BMW F 800 GS: 63 kW/85 HP engine. USD telescopic fork. Progressive damping spring strut. Spoke wheels. 21-inch front wheel. Aluminum handlebar. 880/850 mm seat height. 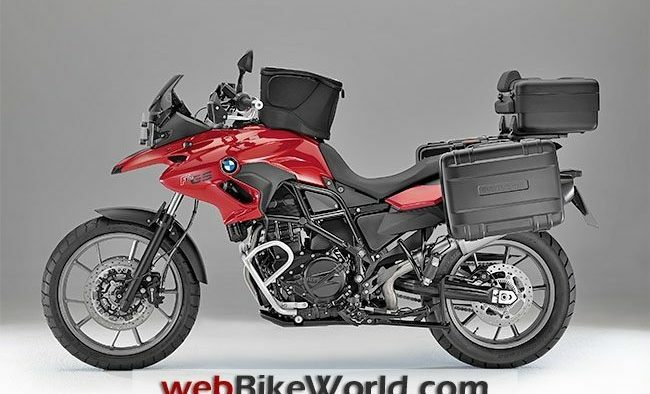 Weight, road ready, 214 kg.BMW F 700 GS: 55 kW/75 HP engine. Conventional telescopic fork. Gas pressure spring strut. Cast wheels. 19-inch front wheel. Steel handlebar. 820/790 mm seat height. Weight, road ready, 209 kg. DrivetrainLike their predecessor models, the F 700 GS and F 800 GS also draw their power from the dynamic, high-torque water-cooled 2-cylinder in-line engine with 798 cc capacity, fuel injection and closed-loop catalytic converter.The parallel twin has not been changed as compared to the predecessor models. Its technical highlights remain a very compact construction with cylinders tilted just 8.3 degrees forward.Included are two overhead camshafts with speed-resistant valve control via rocker arms and the unique mass balance by means of a system of articulated joints running over the center of the crankshaft with specifically arranged counterbalance masses to ensure low-vibration running.Optimized power and torque efficiency and a shorter overall gear ratio in the new F 700 GS.The agile power delivery and revving power of the F 700 GS and F 800 GS are especially thrilling. 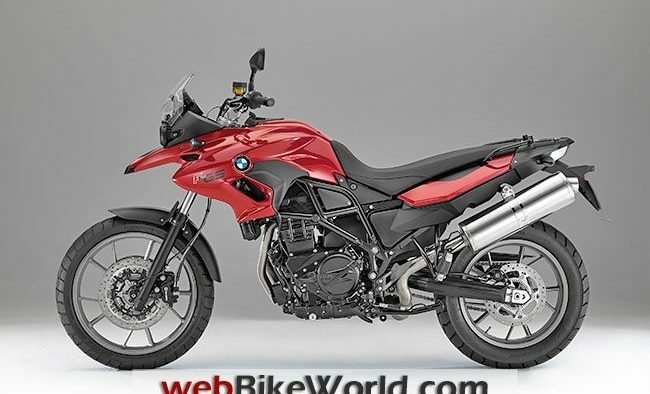 Even in the lower and medium engine speed range, the two new GS models offer a powerful response for dynamic riding fun, whether on or off the road.While the output and torque of the F 800 GS remain unchanged at 63 kW (85 hp) at 7,500 rpm and 83 Nm at 5,750 rpm, the new F 700 GS benefits from an increase in output and torque as compared to its predecessor model. The output has been raised by 4 hp to 55 kW (75 hp) at 7,300 rpm (F 650 GS: 52 kW [71 hp] at 7,000 rpm), and the maximum torque has been increased to 77 Nm at 5,500 rpm (F 650 GS: 75 Nm at 4,500 rpm).This increase in power now requires the use of premium fuel (RON 95) in the F 700 GS too, but both models can also run on regular fuel (RON 91) by means of an optional adaptation of the engine map.For people aged up to 25 taking their motorcycle test (in line with the EU-wide increase in the output limit relevant to those taking a motorcycle license as of 01.01.2013), the F 700 GS and F 800 GS are also available in reduced power versions with an output of 35 kW (48 hp) at 7,000 rpm and a torque of 60 Nm at 5,000 rpm.The same claw-coupled six-speed gearbox has been used as in the predecessor models. In order to enhance spontaneity, liveliness and riding dynamics, the secondary ratio of the chain drive with off-road capability in the new F 700 GS is now somewhat shorter with 17 to 42 teeth (F 650 GS: 17 to 41 teeth). 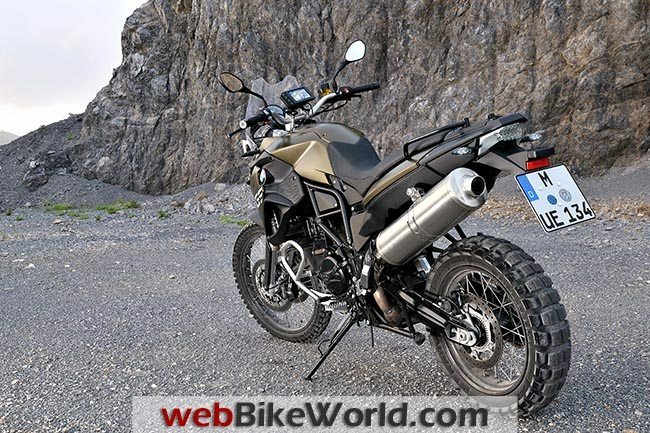 ChassisThe new F 700 GS and F 800 GS continue to feature the robust and torsionally stiff steel frame in tubular construction with the engine integrated as a load-bearing element. The rear frame in square steel tubing, the steering head connection via gusset plates and the single-section chill-cast double-sided swing arm made of aluminum also remain unchanged, reflecting the high-quality finish and slim structure of the two GS models.Dual disc brake system for the F 700 GS.Like the F 800 GS, the new F 700 GS now also has a double disc brake with an effective diameter of 300 millimeters and dual piston floating calipers on the front wheel. The connection between the brake discs and front wheel is floating in both models.On the rear wheel, both models feature a single disc brake with a disc diameter of 265 millimeters and single-piston floating caliper. Both models are fitted with new brake fluid reservoirs which fit harmoniously into the overall appearance.ABS now a standard feature in both models.Based on the BMW Motorrad principle “Safety 360°”, the latest generation of the BMW Motorrad two-channel ABS will be installed as standard for the first time. The new system is not only lighter but is also more compact in size that the previous generation.What is more, it now has inlet valves which can be infinitely adjusted for an even better response. New wheel sensors automatically monitor the distance between sensor and sensor wheel. As usual, the new standard ABS can be deactivated at the press of the button if the rider so wishes – for example for active riding over rough terrain.Electronic Suspension Adjustment ESA as an ex works option.On request (factory option) — and unique for this segment of the motorcycle market — the rider can conveniently set the rebound stage damping of the rear spring strut on the F 700 GS and F 800 GS at the press of a button on the handlebar.This Electronic Suspension Adjustment (ESA) allows adjustment of the suspension settings with maximum operational convenience, even during travel. The rider selects a damping variant from among “Comfort”, “Normal” and “Sport” and the electronic control system measures the appropriate damping rate based on optimum parameters stored in the data memory.Damper settings can be changed simply at the press of a button while riding, with a small, light stepper motor carrying out the commands. A symbol appears in the cockpit accordingly. The adjustment of the spring mount is made manually by means of an optimized, easily accessible hand wheel.Automatic Stability Control ASC as a factory option.Another unique feature within the market segment of the new F 700 GS and F 800 GS is the availability of the BMW Motorrad rider assistance system ASC, one of the most popular ex work options for BMW motorcycles.ASC prevents unwanted spinning of the rear wheel while accelerating, which would result in the loss of lateral grip and thus break-out of the rear wheel.By comparing the rotational speeds of the front and rear wheel obtained via the ABS sensors, the electronic system detects spin in the rear wheel and cuts back engine torque accordingly by reducing the ignition angle as well as adapting injection via the engine control system.In this way ASC makes for more efficient power transmission and therefore increased safety. If regulatory intervention by the electronic system is not desired – on the race track for example – the rider can simply deactivate it at the press of a button, even during travel. 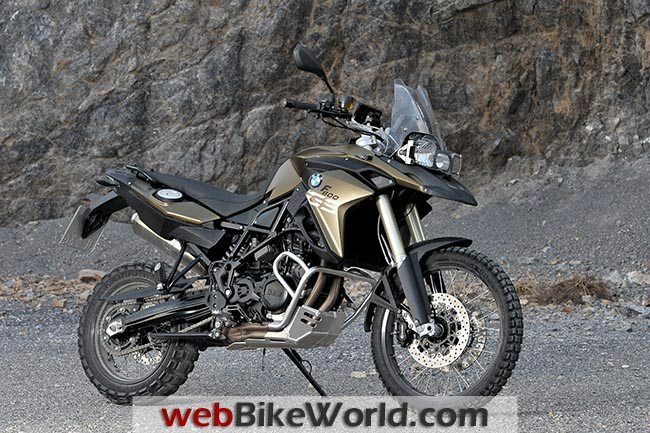 2013 BMW F 800 GS. Electrical and Electronic SystemsIn terms of the electrical system, the new F 700 GS and F 800 GS continue to use a CANbus system. This single-wire system (SWS) offers a wealth of benefits: it reduces the amount of wiring required, allows all control units to be networked and thus makes comprehensive diagnosis much simpler.What is more, conventional fuses are no longer required because the system automatically deactivates any component affected in the event of malfunction. Since the introduction of CAN bus technology, electronic vehicle immobilization has been a standard feature of BMW motorcycles.To start the engine, more is required than the appropriate key bit: the chip integrated in the BMW key also has to send the correct code to the ring aerial of the combined handlebar and ignition lock. Only then does the engine control system allow the engine to be started.This technology offers what is currently the most secure and reliable protection from theft. A battery with 14 ampere-hours and an alternator with an output of 400 Watts ensure a reliable power supply.New switch units and an extended range of information.The latest generation of BMW Motorrad switches is now used in the new F 700 GS and F 800 GS, too. The new switch units are much smaller and more compact thanks to MID technology (MID = Molded Interconnect Design; printed conductors rather than individual wiring) and offer a wider range of functions, a clear design and optimum usability.Here the functions for the left and right turn indicators, previously separated, are now clustered in a single function on the left-hand side of the handlebars.The hazard warning flashers are activated via a separate, clearly visible switch integrated at the top of the left-hand handlebar panel. The functions for low beam, high beam and headlamp flasher have been combined in a switch which is located near the left index finger for convenient access.The activation switch for the grip heating has been placed at the top for further improved usability and the functions for starter and killer switch practically combined in a rocker switch. This means that if the killer switch is activated by mistake, it prevents the starter from being triggered when the ignition is not switched on and discharging the battery.ESA and ASC are also activated by means of a combined rocker switch. The cockpit of the new F 700 GS and F 800 GS with vertically arranged analog engine speed display and speedometer and information panel has been optimized.Newly designed dial faces now ensure even better legibility of road speed and engine speed. And the rider now gets feedback on the fuel level and coolant temperature as a standard feature; two functions which were previously only available as ex work options with the on-board computer. Body and DesignAs in the popular predecessor models, the F 700 GS and F 800 GS of model year 2013 also benefit from reduced width in the area of the seat and front section due to the slimline construction of the frame and engine, ensuring optimum ground reach and a narrow standing width.The low overall center of gravity makes for outstanding off-road qualities and easy vehicle control, and the large steering angle, derived from a narrow steering head, is a bonus when riding over rough terrain.Wide handlebars suitable for enduro riding (made of cylindrical steel tubing with a new clamp in the F 700 GS and of double-butted aluminum tubing in the F 800 GS) support the easy, agile handling of the two machines.The wide range of adjustment provided in the hand levers for the front brake and clutch allow adaptation to individual rider preferences. The wide footrests with vibration-damping, removal rubber tops are ideal for off-road riding and lengthier tours.The new BMW F 700 GS and F 800 GS display their kinship as authentic members of the BMW GS family more strikingly than previously with revised body features and optimized ergonomics. Their slim, wiry look gives them a feeling of lightness designed to arouse the desire to embark on motorcycle adventures.Clear lines and the selective combination of painted areas with black components give them a purist appearance with a dash of robustness typical of the enduro style.Off-road or urban – new, authentic characters with optimized functionality in typical GS style.The model revision has given the front sections of the new BMW F 700 GS and an even clearer shaping, perfectly in line with the character of the model. 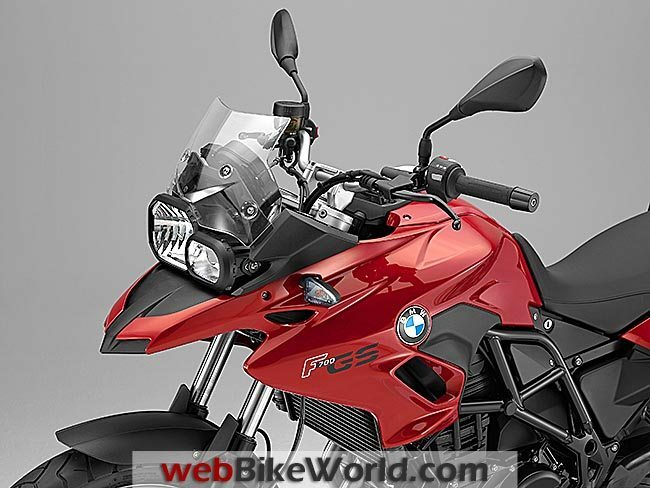 The new side trim sections are a key element here, giving both models a perceptibly more striking look.The new body features of the F 700 GS and F 800 GS also include a reworking of the “beak” above the front mudguard; a BMW GS hallmark. This has been redesigned in both models, providing excellent functionality as a splash guard in keeping with the orientation of the F 700 GS and F 800 GS.Different windshields are available for the two models to match the specific character of each of them. 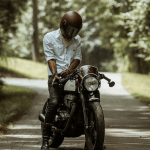 These offer optimum protection from airstream and integrate perfectly in the styling of each bike. As always, the extensive BMW Motorrad range of special accessories offers alternatives here: a choice of tinted or more touring-oriented windshields leave nothing to be desired in terms of individual customization.The overall impression conveyed by the lines is much more dynamic. 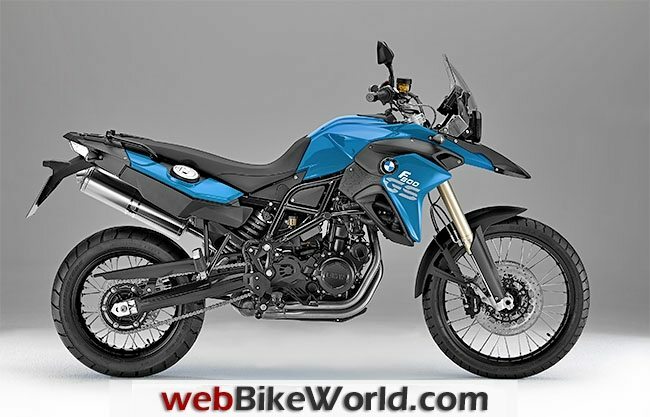 The flatter design of the lower edge means the new side sections give the vehicle a more elevated, mature look, especially in the new F 700 GS.Meanwhile the differing design of the intake snorkel and the positioning of the BMW logo, model inscription and turn indicators highlight the distinct characters of the two 2-cylinder models.While the new F 800 GS displays its masculinity and off-road capability, the new F 700 GS emphasizes its urban character. New smoke grey glasses for the turn indicators and a smoke grey glass covering on the LED rear light cluster reflect the dynamic aspirations of the new F 700 GS and F 800 GS, now offering a more harmonious match with the overall look of the new BMW GS models.Optional seat height reduction based on lowered suspension now also available in the new F 800 GS.With a standard seat height of 880 millimeters, the BMW F 800 GS clearly reflects its off-road orientation with long spring travel. In response to frequent requests for a reduced seat height, especially among shorter riders, BMW Motorrad now offers a lowering option in the F 800 GS in conjunction with a low seat. A reduction by 60 millimeters to just 820 millimeters now ensures accessibility and reachability for riders of smaller stature. 2013 BMW F 700 GS Dashboard. New: Lowered suspension for the F 800 GS (not in conjunction with ESA, center stand or safety package). New: Power reduction to 35 kW (48 hp). New: Engine map adaptation for regular fuel (ROZ 95) for F 700 GS. New: Case holder for Vario case. New: Comfort package (on-board computer, heated grips, case holder, center stand). 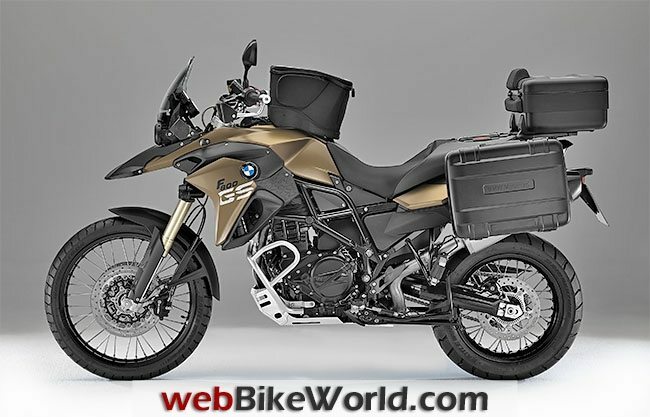 New: Safety package for F 800 GS (ASC, ESA). New: Safety package for F 700 GS (ASC, ESA, RDC). Off-road tires (F 800 GS only). Tire pressure control RDC (F 700 GS only). New: LED additional headlamp (F 800 GS only). Hand protector (small and large) for hand protector bar. Attachment spoiler for hand protector, large. Engine guard, plastic (F 700 GS only). Luggage:Luggage carrier, small. Luggage rack, large, for Vario topcase. Vario topcase, black. Case holder for Vario case. Vario case, black. Liners for Vario case and Vario topcase. Back pads for Vario topcase.Aluminum Luggage:Aluminum case (F 800 GS only). Functional liner for aluminum case (F 800 GS only). Carrying handle for aluminum case or topcase (F 800 GS only). Case holder for aluminum case (F 800 GS only). Aluminum topcase (F 800 GS only). Functional liner for aluminum case (F 800 GS only). Back pad for aluminum topcase (F 800 GS topcase). Topcase holder for aluminum topcase (F 800 GS only).Soft Luggage:Tank rucksack, waterproof. Softbag 2, small. Enduro rear bag.Other Options:LED turn indicators. Headlamp guard (for off-road use only). Splash guard extension, rear. Akrapovič sports silencer.Ergonomics and comfort:New: Windshield small, tinted (F 700 GS only). Windshield large, clear (F 700 GS only). Windshield large, tinted. Touring windshield (F 800 GS only). Wind deflection set (F 800 GS only). New: Enduro footrests, wide. Heated grips. Rallye seat. Comfort seat. Low seat. High seat (for F 700 GS only). Optimized center stand.Navigation and communication:BMW Motorrad Navigator IV. Holder for BMW Motorrad Navigator IV. Function pouch for BMW Motorrad Navigator IV.Maintenance and technology:On-board toolkit. Repair kit for tubeless tires. Power reduction to 35 kW (48 hp). Automatic chain lubrication system. LED lamp for charging socket. Battery charger. 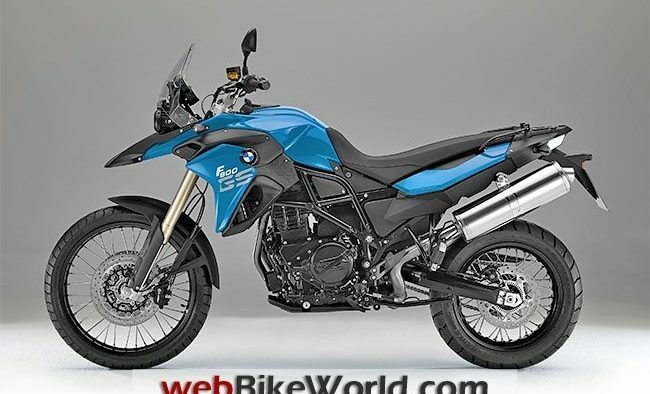 Paint and ColorsThe new F 700 GS and F 800 GS also reflect their more sharply drawn character in the form of new color concepts. Ostra grey metallic creates a deliberately modern variant of the F 700 GS with a masculine, off-road touch.Meanwhile, Red apple metallic gives the F 700 GS a more discreet, touring-oriented appearance, while in Glacier silver metallic it has a light, dynamic feel which emphasizes its sporty qualities.The new F 800 GS acquires a particularly technical, modern and off-road look in Kalamata metallic matt, while Cordoba blue highlights the bike’s sporty, dynamic qualities. In Alpine white 3, on the other hand, it appears especially light and athletic. 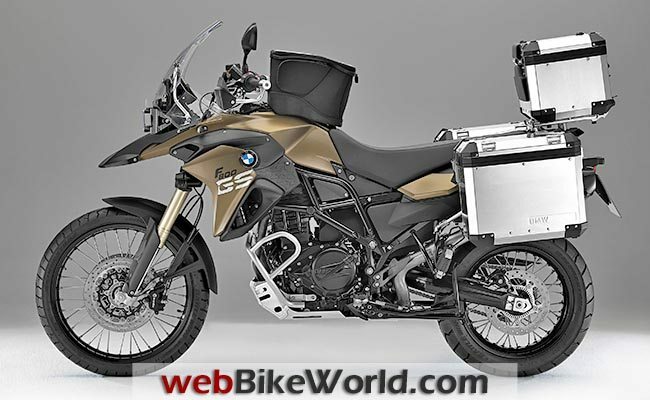 2013 BMW F 800 GS Aluminum Luggage Option. Note: For informational use only. All material and photographs are Copyright © webWorld International, LLC since 2000. All rights reserved. See the webBikeWorld® Site Info page. Product specifications, features and details may change or differ from our descriptions. Always check before purchasing. Read the Terms and Conditions!Owner Comments and FeedbackPlease send comments to editor@webbikeworld.com.Comments are ordered from most recent to oldest.